Morooka’s loaders and carriers offer reliability and durability to professionals in the construction and landscaping industries. As a result of a hydrostatic hydraulic system, this line of machinery operates well in a variety of terrains, and can handle most all job requirements. The MST series of equipment provides compact solutions in tight working conditions with superior performance. Dominion Equipment Parts is the exclusive OEM parts distributor for Morooka Rubber Track Carriers in the United States, Canada, Mexico, Central and South America. 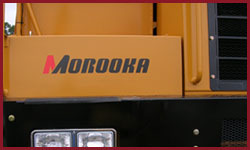 Give one of our knowledgeable sales people a call at 1-866-759-5557 to discuss your Morooka parts needs. Dominion Equipment Parts firmly believes in our products, and strives to earn your satisfaction. This is why we offer exceptional warranties on all tracks and parts. Morooka parts are always in stock, and most destinations are eligible for one-day shipping. If at any time you have a problem with your replacement parts, call us and we’ll handle it. Our goal is to provide customers with quick, dependable service and high quality Morooka parts so that you can keep moving.